Whilst out hunting Jason, Pythagoras and Hercules find a baby, abandoned in the woods. At first they aren’t sure if they should rescue the baby or not as there are many reasons why a baby would be abandoned, such as the parents not wanting the baby, for whatever reason they chose. Jason makes them see sense and rescue the baby but that turns out to be a rather rash move from Jason as it soon turns out that the baby is the son of a visiting King who wants the baby dealt with for a very specific reason which we find out at the end of the episode. There was a bit of intrigue in this episode and a bit of a moral dilemma at the centre with both sides being shown to do whatever they are doing for what they consider to be reasonable reasons to do so. 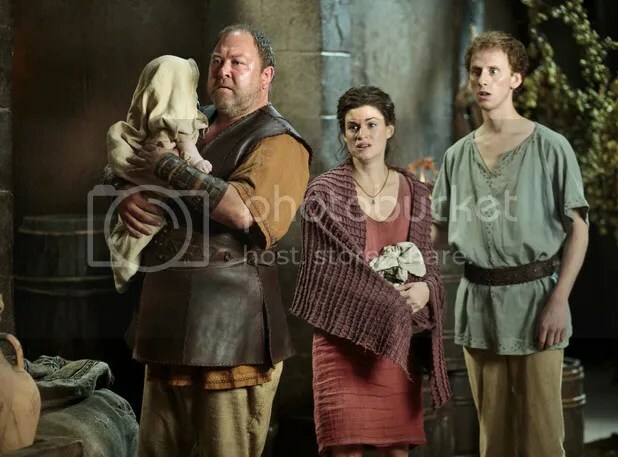 Mark Addy is on top form from Hercules who starts of not wanting to be anywhere near the baby to being its greatest protector and actually becoming very fond of the little tyke. Admittedly at the first it was only because it pleased Medusa and he thought that he must be in there but after a while genuine fondness grew between Hercules and the child. Medusa had a bit of a larger role in this episode which was nice to see but was still relegated to being the only person who really knew how to deal with baby rather than much else but it is a start and better than last week. Pythagoras is more often than not comic relief and for the most of the time might as well not even be there. Jason gets to be a bit heroic and Hercules gets the best lines and now thinks that he has a genuine chance with Medusa. We also found out about the reasons why the baby was abandoned which ticked off yet another myth and legend from the list and made sense within the context of the story and the characters.